Today, I wake up next to my husband/best friend/partner in life. Kalvin and I prayed for a good weather, and God granted our prayers. Ever since we’ve arrived in Bali, there was not even a drop of rain that fell. The weather was perfect. 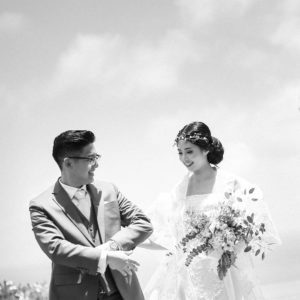 We heard from others that it was raining in Seminyak area, but somehow, there was not a single drop of rain in our wedding venue, Uluwatu. To top it off, the band, decorations, and vendors were great. We are really happy and grateful for everyone who was involved in this wedding. All the stress and hard works were paid off. We’re so grateful and thankful. We couldn’t thank everyone enough for the time and effort they have sacrificed to attend our wedding. Everyone had spent their weekend to fly to Bali from all over the places. It really meant so much to us. We were so grateful to be able to share our happiness and our special day with closest friends and family. We’d also love to thank everyone who has shown love and support through comments in social media. Your wishes meant so much to Kalvin and I.
I guess, that’s all I can say for now. I’m feeling really happy at the moment as everything really went smoothly beyond expectations.